HICKORY, N.C.--(BUSINESS WIRE)--Apr. 4, 2019-- CommScope (NASDAQ: COMM), a global leader in infrastructure solutions for communications networks, has completed its acquisition of ARRIS International plc (NASDAQ: ARRS), a global leader in entertainment and communications solutions. The acquisition brings together two companies—established and respected leaders in their respective markets—with a unique set of complementary assets and capabilities that are expected to enable end-to-end communications infrastructure and connectivity solutions, something that neither company could achieve on its own. The combination of the companies, which includes Ruckus Networks, is expected to create new opportunities across multiple markets, while increasing the companies' relevance and importance with existing networking customers. 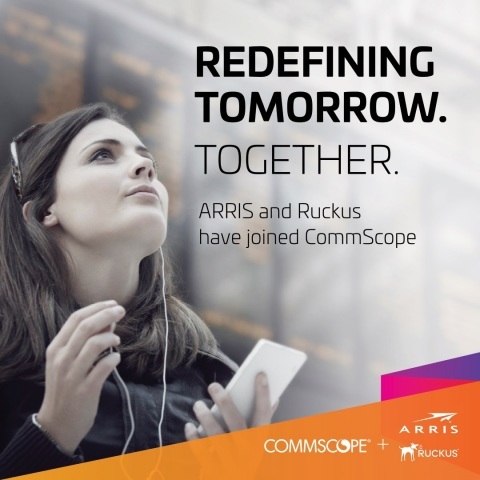 CLICK TO TWEET:The combination of CommScope, ARRIS and Ruckus will unleash more potential, capabilities and success for your networks. "This is a major milestone in the evolution of these two great companies and a significant moment for our industry," said Eddie Edwards, president and chief executive officer, CommScope. "With the completion of this exciting transaction, we are creating a new CommScope that will help shape communications connectivity and networks of the future with greater technology, solutions and employee talent. We are committed to building on our well-established track record in prior transactions of meeting or exceeding our synergy targets and generating significant value for shareholders. "We are focused on ensuring CommScope, with the fully integrated ARRIS and Ruckus businesses, is at its best financially, operationally and competitively. We are confident in our ability to solidify our leadership positions in the markets we serve and capitalize on opportunities in new markets. I look forward to continuing to work closely with all of our employees, including our new team members from ARRIS, as we strive to create a growth-oriented, innovative company focused on leading the upcoming network transformations." As previously announced, The Carlyle Group, a global alternative asset manager, has reestablished an ownership position in CommScope through a $1 billion minority equity investment as part of CommScope's financing of the transaction. In connection with the closing of the transaction, Daniel F. Akerson and Campbell R. Dyer, representatives of The Carlyle Group, have been appointed to the CommScope board of directors, effective immediately. "I believe this is a once-in-a-lifetime combination of two great companies that are poised to make a lasting impact on the communications industry and the customers we serve," said Bruce McClelland, formerly chief executive officer of ARRIS and now chief operating officer at CommScope. "Together, we combine great employee talent and experience, an impressive record of innovation and industry firsts, and a sharp focus on creating a world-class customer experience. The entire ARRIS team and I are eager to get started and help make CommScope one of the top names in technology." CommScope (NASDAQ: COMM) and the recently acquired ARRIS and Ruckus Networks are redefining tomorrow by shaping the future of wired and wireless communications. Our combined global team of employees, innovators and technologists have empowered customers in all regions of the world to anticipate what's next and push the boundaries of what's possible. Discover more at www.commscope.com/arris-ruckus. This press release or any other oral or written statements made by us or on our behalf may include forward-looking statements that reflect our current views with respect to future events and financial performance. These statements may discuss goals, intentions or expectations as to future plans, trends, events, results of operations or financial condition or otherwise, in each case, based on current beliefs of management, as well as assumptions made by, and information currently available to, such management. These forward-looking statements are generally identified by their use of such terms and phrases as "intend," "goal," "estimate," "expect," "project," "projections," "plan," "potential," "anticipate," "should," "could," "designed to," "foreseeable future," "believe," "think," "scheduled," "outlook," "target," "guidance" and similar expressions, although not all forward-looking statements contain such language. This list of indicative terms and phrases is not intended to be all-inclusive. These forward-looking statements are subject to various risks and uncertainties, many of which are outside our control, including, without limitation, risks related to the ARRIS acquisition, our dependence on customers' capital spending on data and communication systems; concentration of sales among a limited number of customers and channel partners; changes in technology; industry competition and the ability to retain customers through product innovation, introduction and marketing; risks associated with our sales through channel partners; changes to the regulatory environment in which our customers operate; product quality or performance issues and associated warranty claims; our ability to maintain effective management information technology systems and to implement major systems initiatives successfully; cyber-security incidents, including data security breaches, ransomware or computer viruses; the risk our global manufacturing operations suffer production or shipping delays, causing difficulty in meeting customer demands; the risk that internal production capacity or that of contract manufacturers may be insufficient to meet customer demand or quality standards; changes in cost and availability of key raw materials, components and commodities and thepotential effect on customer pricing; risks associated with our dependence on a limited number of key suppliers for certain raw materials and components; the risk that contract manufacturers we rely on encounter production, quality, financial or other difficulties; our ability to integrate and fully realize anticipated benefits from prior or future divestitures, acquisitions or equity investments; potential difficulties in realigning global manufacturing capacity and capabilities among our global manufacturing facilities or those of our contract manufacturers that may affect our ability to meet customer demands for products; possible future restructuring actions; substantial indebtedness and maintaining compliance with debt covenants; our ability to incur additional indebtedness; our ability to generate cash to service our indebtedness; possible future impairment charges for fixed or intangible assets, including goodwill; income tax rate variability and ability to recover amounts recorded as deferred tax assets; our ability to attract and retain qualified key employees; labor unrest;obligations under our defined benefit employee benefit plans requiring plan contributions in excess of current estimates; significant international operations exposing us to economic, political and other risks, including the impact of variability in foreign exchange rates; our ability to comply with governmental anti-corruption laws and regulations and export and import controls worldwide; our ability to compete in international markets due to export and import controls to which we may be subject; the impact of Brexit; changes in the laws and policies in the United States affecting trade, including recently enacted tariffs on imports from China, as well as the risk and uncertainty related to other potential tariffs or a potential global trade war that may impact our products; costs of protecting or defending intellectual property; costs and challenges of compliance with domestic and foreign environmental laws; the impact of litigation and similar regulatory proceedings that we are involved in or may become involved in, including the costs of such litigation; risks associated with stockholder activism, which could cause us to incur significant expense, hinder execution of our business strategy and impact the trading value of our securities; and other factors beyond our control. These and other factors are discussed in greater detail in our 2018 Annual Report on Form 10-K. Such forward-looking statements are also subject to additional risks and uncertainties related to ARRIS' business, many of which are outside of our and/or ARRIS' control, including, without limitation: the risk that we will not successfully integrate ARRIS or that we will not realize estimated cost savings, synergies, growth or other anticipated benefits, or that such benefits may take longer to realize than expected; risks relating to unanticipated costs of integration; the potential impact of announcement or consummation of the acquisition on relationships with third parties, including customers, employees and competitors; failure to manage potential conflicts of interest between or among customers; integration of information technology systems; and other factors beyond our and/or ARRIS' control.